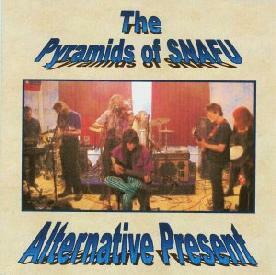 The Pyramids Of Snafu - "Alternative Present"
Band Members: Chris Barnett - violin; Stu:Art Barton - synths, keyboards, guitar; Melissa Joseph - bass; Terry Ollis - drums, percussion; Mick Slattery - lead guitar; Colin Wilson - vocals, rhythm and lead guitar; Jaki Windmill - djembe, backing vocals. With Terry Ollis, Mick Slattery and Jaki Windmill making up nearly half of this band, you might be expecting them to sound like a miniature version of early Hawkwind and the current Spaceritual band. Fortunately you'd be pleasantly surprised by the variety of influences that pervade the style and content of this excellent debut release. You can compare the band with High Tide, ANOMIE, folksy Hawkwind circa 1969-1970, the gentler side of the Pink Fairies and even a bit of Magic Muscle/ Ethereal Counterbalance. In effect what we have is a glorious mix of some of the best psychedelic underground of the early 1970s. With such a grand heritage to draw on, it would be easy for the Pyramids of SNAFU to sound dated; fortunately they manage to avoid this with some great tunes. In general terms, they take their cue from High Tide et al, but rather than following the grinding rock that you associate with Tony Hill, they produce a collection of musical moments that draw on the more reflective and melodic aspects of psychedelia - think of Hall of the Mountain Grill era Hawkwind, rather than early Deviants or Outskirts of Infinity. What this band does provide, is a vehicle for the talents of Mick Slattery - there is some absolutely stunning guitar work on all of the tracks - but especially on "Free Energy". This is a song that will get you hooked on the band on the very first listen - it is by far the stand out track. There are however minor problems with this release. For a self financed release, the production side unfortunately suffered - more could be made of layering the vocals to give a bit more depth and inflection to Colin Wilson's vocal style. As the cd was recorded 'live in the studio', there are times when Colin's vocals sound weak in the overall mix - something that is not beneficial to his voice. The second track, "Beyond Belief" is an ANOMIE track that usually has the original Zapruder footage and witness recordings and, for obvious reasons, had to be recorded differently and suffers as a result - but you do get a feel of how this would sound live. These are just minor criticisms of an interesting and highly enjoyable debut release and as a sampler of a forthcoming album, I expect good things to come from it and I look forward to its' release in the near future. Individually the tracks offer a variety of faces and facets of the band. "First Love" betrays a strong High Tide influence, which is no bad thing, a forceful rhythm and strong drumming provides the basis over which the violin soars - reminiscent of Simon House at his best. We have glimpses of Mick Slattery's abilities as a guitarist in a medium paced rocker straight out of the late 60s songbook. This is a great start to the EP. It builds up over the course of the song, with the guitars gaining power and momentum. "Beyond Belief" begins with a spoken intro about the assassination of JFK. However, despite this, we have a beautifully crafted song which allows for a more mellow approach for both lead guitar and violin but with glimpses of the power chords always threatening to burst out. You can image that this could easily become a live favourite with its mellow and raw dichotomy. "Chatter" reminds me of Tim Blake on the Magic album for some reason. Not particularly the lyrics but rather in the style of delivery, which is very effective on this song. This is a good solid song that really allows for a clear outing for the bass. There is really much else to say about this track - it is a great tune with effective and pounding drums from Terry Ollis. "Free Energy" is the fourth and final track on this EP and is by far the best on it. A seven minute plus instrumental which exposes the excellent performances of the whole band, although it should be pointed out that the guitar work on this track is astounding. Mick and Colin both prove that they are more than good at playing the guitar - they are fantastic. This track is worth the price of the cd on its' own and hopefully there will be more like it on the forthcoming album. Another highlight is Jaki Windmill's soaring chant, used brilliantly as another instrument, that comes in and out during the course of the song. "Free Energy" has definitely upped the ante for this band and has set a very high standard, which all the rest of their songs will now have to meet. This is a stunning debut from a band that has integrated members of Spaceritual into a fully functioning celebration of psychedelia. This cd deserves to sell and bring the Pyramids of Snafu to the attention of a much wider audience. If you get the chance go see them - on the basis of this, they will be well worth the admission price. Alternative Present is directly from The Pyramids Of Snafu. You can email them at: M.Joseph@uea.ac.uk. It is also available from CD Services. You can visit their web site at: http://www.cd-services.com.